Annulus fibrosis – Cartilage-like material formed in a series of rings surrounding the nucleus pulposus (soft center) of a disc. Backache – An ache or pain affecting the back, most commonly the lower back. This is because the low back supports most of the body’s weight. You may have a tingling or burning sensation, a dull aching, or sharp pain and may also experience weakness in your legs or feet. Cauda equina – A region at the lower end of the spinal column in which nerve roots branch out in a fashion that resembles a horse’s tail. Cervical – The neck region where the vertebrae (bones of the spine) curve forward. Chemonucleolysis – A surgical procedure in which an enzyme is injected to dissolve a portion of the intervertebral disc. Chiropractic – A system of alternative medicine of mechanical therapeutics first introduced in 1895 in the USA. Chiropractic associates many diseases on the poor alignment of the vertebrae resulting in a disruption in the functioning of the nerves. Chiropractors – Treat disease with traction, manipulation and adjustment of the displaced vertebrae in order to relieve pressure on the nerves. CT scan – A sophisticated x-ray using a computer to produce a detailed crosssectional three-dimensional picture of the bone and discs. Discectomy – Surgical removal of part or the entire herniated intervertebral disc. Electrical nerve stimulation – A type of physical therapy treatment that utilizes various frequencies and wave forms of electrical current, which have therapeutic effects on the nervous and musculoskeletal systems. Electromyography (EMG) – Procedure that tests nerves and muscles providing information to help determine if surgery may be required. Herniated disc – Also known as a slipped disc – A disc that is displaced from its position between two vertebrae, with injury to the annular ligament. Ligament – Strong, dense structures made of connective tissue that stabilize a joint, connecting bone to bone across the joint. Low back pain – Pain at the base of the spine that can be caused by several factors. Lumbar – The low back region that curves forward in the same direction as the cervical spine. Lumbago – a symptom defined as a mid to lower back pain which may extend to the buttocks, thighs and legs in either a unilateral or bilateral fashion. One of the most common causes of lumbago is a herniated intervertebral disc. Magnetic Resonance Imaging (MRI) – Magnetic radio frequency energy used to see internal structures of the body, including bone, discs, and nerves without the use of xrays. Nucleus pulposus – Soft center of an intervertebral disc, made up of gel-like substance. Osteophyte – A small, abnormal bony outgrowth. Pinched nerve – A pinched nerve is a nerve with pressure applied to it. In the spine, a pinched nerve is usually caused by a herniated disk pressing on it. Pinched nerves in the spine tend to happen in the neck and low back as these are the areas that do the most moving. Symptoms of a pinched nerve are: weakness, tenderness, prickly sensation, stabbing sensation, burning sensation . Prolapsed disc – A disc that bulges out from its position between two vertebrae. Ruptured disc – A disc with a torn annulus (the tough outer covering of a disc). Sciatic nerve – The nerve that serves the legs and originates from several levels of the lower back. Sciatica – An inflammation of the sciatic nerve usually marked by tenderness along the course of the nerve through the buttocks, thigh, and leg. Spinal cord – The column of nerve tissue that runs from the brain to the lower back. Spinal fusion – A process in which the disc and cartilage is removed from between the vertebrae, and bone grafts (often harvested from the pelvis) are placed between or alongside the vertebrae to join the bones together. Stenosis – Narrowing of a portion of the spinal canal, usually because of bony overgrowth. Slipped disc – Also known as a herniated disc (medical term: prolapsed intervertebral disc) – The disc does not actually “slip,” but rather a portion of the disc breaks off or bulges and protrudes into the spinal canal creating pressure against one or more of the spinal nerves which can cause pain, weakness or numbness in the area of the body served by those nerves. Tendons – White glistening fiber bands of tissue that attach muscle to bone. Thoracic – The trunk region where the vertebral column curves in a rearward fashion. Vertebral column – Flexible structure that forms the “backbone” of the skeleton, arranged in a line from the base of the skull to the tailbone, houses and protects the spinal cord; also called the spine. Whiplash – The sudden movement of the head backwards, forwards or sideways is commonly referred to as whiplash. Whiplash injury most commonly occurs in car crashes involving sudden deceleration but the injury can also occur in other strenuous physical activities by an accidental motion or force applied to the neck that results in movement beyond the neck’s normal range of motion causing neck pain. Patients with a history of spinal surgery with implants (fusion, disk replacement, stabilization with metallic or plastic hardware) need to be pre-treated with an antibiotic if dental work is needed within 24 months of surgery. It is commonly recommended to avoid routine dental procedures for the first 3 months following a spinal fusion. For 24 months after surgery, we suggest antibiotic therapy. After 24 months, no antibiotics are necessary. Herniated disc, commonly known as a ‘slipped disc’, is the most severe of lower back disorders and occurs when the inner center of the disc pushes out, pressing on the nerves and causing pain in the back all the way down to the foot. This pain can be excruciating. It can create a condition known as ‘drop foot’ due to strong pressure on the nerves. The inter-vertebral discs can be injured by sudden and severe trauma. Much more common is a small disc bulge which might be present for some time and is only noted when a sports injury is medically evaluated. The good news is that very few herniated discs lead to persistent trouble or require surgery. Although pain can last a few weeks, the majority of disc-related problems are a self-limiting medical condition which may be resolved with physical therapy, decompression, and medication, and very rarely requires surgery. It can easily be treated with the Cervico 2000 (for slipped discs in the neck) or with the Vertetrac (slipped discs in the lower back). We are looking for distributors in certain countries – if this is of interest, please contact us with more information about your company such as which products do you currently supply, a list of clients and why our products are of interest. Please include a company profile and/or a website address and contact information. Currently seeking to partner with clinics and hospitals in all of our territories. If your organisation is a leading authority in your country on any of the ailments our devices treat, please contact us and tell us why you would like to become a MediSpera Partner and/or its distributors & dealers. How Can I Purchase Your Devices? Drop us an email or call us and we’ll either put you in touch with your local distributor or supplier, or sell to you directly, depending on the type of device and on where you are based and if there is an appointed distributor or dealer in your geographic area. When contacting us be sure to tell us your full name, where you are based, whether you are a patient, dealer or distributor, which devices you are interested in, and in what quantity. We will aim to respond the same day or within one working day. The diagnosis of scoliosis and the determination of the type of scoliosis are then made by a careful bone exam and an X-ray to evaluate the magnitude and degree of the curve. We sell in the UK, Ireland, the Middle East and in some cases, the Far East. If you are from these territories please get in touch. If you still wish to purchase these devices and are from another territory, we may be able to sell to you. Either way, contact us and we will do our best to either serve you directly, or to point you in the right direction. There is a lot of information on our website and YouTube regarding our devices. If you require additional information or if you are a patient and are not sure if our devices will suit your condition, contact us and we will do our best to answer all of your questions before you purchase and of course, post purchase. Is There a Discount on Quantity? If you wish to purchase a number of devices in the same order, please contact us to determine the minimal order quantity for a particular device in order to incur a discount. Is treatment with spinal traction preferable to surgery? In a majority of cases, using Meditrac’s spinal decompression medical devices is preferable to surgery. This is due to the fact that surgery physically alters the spine by removing all or part of the problematic disc. Although this can reduce the pressure on the nerve and relieve back pain, the surgery tends to place more stress on the healthy discs directly above and below the problematic disc. Other complications may include phlebitis in your legs, blood clots in the lungs, or urinary problems. We do not ignore the fact that there is a small percentage of cases that do indeed require surgery or medication. In some cases, surgery can significantly help back pain sufferers. But surgery should always be a last resort, offered only when conservative, non-invasive treatments have failed. We recommend that you exhaust all other avenues before deciding to go ahead with surgery. “Conservative treatment” is a common term used to describe the different types of non-surgical treatments. Since almost all people who have spine-related problems do not require surgery, conservative treatments play a major role in dealing with spinal disorders. However, there are wide selections of conservative treatments available, and sometimes it can be very difficult to make sense of all the choices. It is very important to consider the appropriate conservative treatment for your spine, and this section is specifically designed to provide you with a review of how different health-care professionals, including osteopaths, chiropractors, and physiotherapists approach spinal disorders. This information will aid in your decision of who might help you and who you may want to consult with first. Back education – This involves teaching proper posture and lifting techniques as part of a total back care program. This information helps people to adapt and adopt the right attitudes about the body and its functional use. Electrical nerve stimulation – This includes transcutaneous electrical nerve stimulation (TENS), in which electrodes are placed on the back to gently stimulate nerves and helps alleviate pain. TENS appears to be helpful for some people with spinal stenosis, but has not otherwise been found to be generally helpful. An alternative version delivers the electrical stimulation through acupuncture needles. Treatment generally consists of 45 minute sessions three times a day. Most people hardly feel the electrical sensation. Flexibility and strengthening exercise programs – These types of programs are important for keeping the lower back muscles flexible and strong. They are among the main safeguards for preventing future back injuries. It is important to begin slowly and progress as tolerated, using pain as your guide. The old adage “no pain, no gain” is not the rule of thumb for the recovery of back pain. Heat – Heat usually is applied when there is a small area of tissue damage or inflammation. Electrical currents can be used to relieve pain and also to stimulate circulation in the deeper tissues. Hydrotherapy – Hydrotherapy involves the use of water to treat physical disorders and may include baths, spas, pools, or shower sprays. Spinal decompression – spinal decompression, or spinal stretching, equipment has been used to help decrease pressure on the nerve roots and provide a stretch to tight muscles in the back. Spinal traction has been well recognized since ancient times as an effective treatment for various spinal disorders. Tissue mobilization and massage techniques – Massage and a variety of soft tissue mobilization techniques are being used more often by therapists who specialize in manual therapy. These techniques may be helpful to increase circulation to the area, release muscle spasms, and stretch back tissues. What are the risks inherent in this type of surgery? What will the surgery involve exactly? How many spinal surgeries has this particular surgeon performed and what is the incidence of complications? Is this a teaching hospital and if so, will anyone other than the designated surgeon be performing the surgery? If the surgery is for a child, is a neurosurgeon part of the operating team? Will there be in a lot of pain? What medication is given to help with the pain? Should I or someone else donate blood? Will I need a transfusion? How long will the patient be in hospital? If surgery is for a child or adolescent, are there parent facilities? What kind of physical limitations will I have post-op? If the patient does not have the op, what kind of physical limitations will I suffer as a consequence? Will the patient need to wear a brace after surgery? Will the patient require physical therapy? If so, for how long? How soon after surgery can the patient shower or wash their hair? How long before return to school or work? How long before the patient can be active again (i.e., play sports)? Will surgery limit flexibility (e.g., bending over, ability to walk, range of motion?). If so, for how long? Which is preferable? Allograft bone or own bone harvested? If spinal fusion or implants is part of the op, will the patient need to take antibiotics before dental work? Will the metal detectors go off in airport security if rods are placed in my spine? Will more than one surgery be required? Who can I speak with or what can I read to better prepare for surgery? What pre-op testing is needed before surgery? All of our medical devices are CE Marked. Some are FDA approved and may require a prescription from a professional. If you require specific information regarding a device, please contact us for specific details. Back pain problems are very common in both athletes and non-athletes alike. Up to 20% of all sports injuries involve the lower back or neck. In recent years, in addition to bicycling, running, swimming, racquetball, skiing, golf, and tennis, excessive, exhausting, and even punishing forms of sports, physical training, and exercise are being undertaken. These new types of extreme physical activities include bungee jumping, rollerblading, snowboarding, paragliding, and windsurfing, to name a few. All of these activities carry with them the risk of sports injuries. Sports injuries result from acute trauma or repetitive stress associated with athletic activities which can affect bones or soft tissue and require specialized care to promote optimum healing. For obvious reasons, athletes are at greater risk of sustaining a lumbar (lower) spine injury due to physical activity. Whatever the sport, the spine undergoes a lot of stress, absorption of pressure, twisting, turning, and even bodily impact. Mechanical Low Back Pain: This is the most common type of back problem seen in the sports-active individual. It accounts for 70-75% of all back problems and is usually the easiest to treat. Facet Joint Syndrome: The vertebrae are connected by small joints (facet joints) which may become strained and/or inflamed when they undergo forces when the spine is excessively twisting or arching, especially during activities such as tennis, racquetball, or golf. Herniated Disc: Also called a “slipped disc”, a herniated disc is the most severe of low back disorders and occurs when the inner center of the disc pushes out, pressing on the nerves and causing pain in the back all the way down to the foot. This can create a condition known as “drop foot” due to strong pressure on the nerves. The inter-vertebral discs can be injured by sudden and severe trauma. Much more common is a small disc bulge which might be present for some time and is only noted when a sports injury is medically evaluated. The good news is that very few herniated discs lead to persistent trouble or require surgery. Although pain can last a few weeks, the majority of disc-related problems are a self-limiting medical condition which may be resolved with physical therapy, decompression, and medication, and very rarely requires surgery. Degenerated Discs: The discs act as shock absorbers for the spine cushioning the vertebrae. As we age, the discs can degenerate – drying out, shrinking, and losing elasticity and flexibility. Sometimes, a part of the outer covering of the disc wears away or tears, allowing the parts of the disc or its jelly-like contents to press on the spinal nerve roots. Then we may experience numbness, weakness, tingling, or shooting pain down the back of one leg. Degenerative disc disease can result from trauma, infection, or the natural processes of aging. Some disc degeneration commonly occurs in people over 40 even without specific sports injuries. The Vertetrac is a lumbar spinal decompression medical device used to treat back pain and other specific spinal problems. 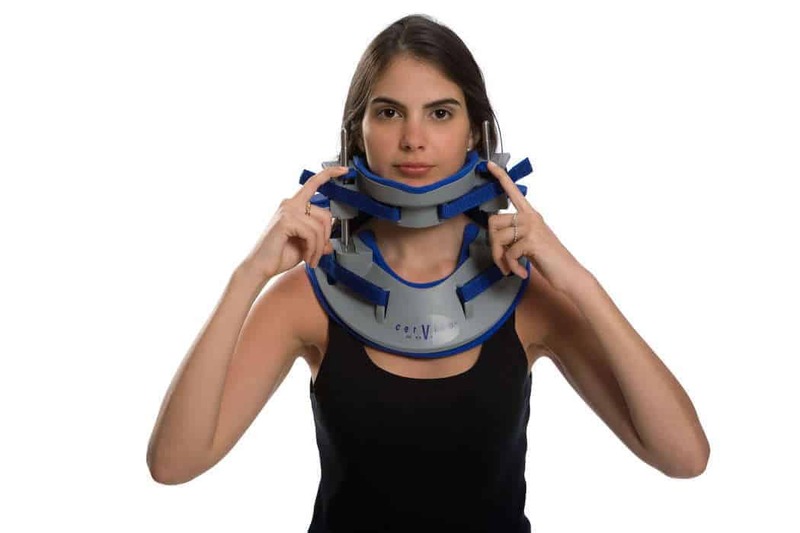 The Cervico 2000 is a cervical spinal decompression medical device used to treat neck pain and problems. While other devices are relatively large, immobile, and take up valuable floor space, both the Vertetrac and the Cervico 2000 are totally portable and relatively lightweight, in spite of being robust. Meditrac’s products require minimal training, and their simple operation even allow self-treatment. Other devices require a trained medical professional and do not afford self-administration of traction. The Vertetrac and the Cervico 2000 afford active exercise during treatment, providing active rehabilitation and accelerated healing. When using other forms of spinal decompression, the patient is required to be immobile and passive. Both devices allow multi-dimensional and symmetrical or asymmetrical spinal decompression and therefore provide beneficial features over other devices (which are restricted to one-dimensional, and symmetrical decompression). The optional Dynamic Brace System (DBS) Scoliosis Rail attachment is another beneficial feature of the Vertetrac, designed to treat idiopathic scoliosis in a most comfortable manner. All of our devices carry a manufacturer’s warranty. The discs in the vertebral column act as shock absorbers for the spine, cushioning the vertebrae. As we age, the discs often degenerate – drying out, shrinking, losing elasticity and flexibility. Sometimes, a part of the outer covering of the disc wears away or even tears, allowing the parts of the disc, or its jelly-like contents, to press on the spinal nerve roots. Due to this, we may experience numbness, weakness, tingling, or shooting pain down the back of one leg (sciatica). Degenerative disc disease, or DDD, can result from trauma, infection, or the natural processes of ageing. Some disc degeneration commonly occurs in people over 40, due to sports injuries or other. A person may be born with scoliosis, caused by a bone abnormality (congenital) or as a result of abnormal muscles or nerves (e.g. cerebral palsy or spina bifida (myelomeninogcele). Other causes may be degenerative, caused by trauma (illness, back surgery or other injury), or osteoporosis. What factors determine the treatment for scoliosis? ‘Conservative treatment’ is the commonly used term to describe the various types of non-surgical treatments. Since almost all people with spine-related problems do not require surgery, conservative treatments play a major role in dealing with spinal disorders. However, there is a wide selection of conservative treatments available, and sometimes it can be very difficult to make sense of all the choices. It is very important to consider the appropriate conservative treatment for your spine, and this section is specifically designed to provide you with a review of how different health-care professionals, including osteopaths, chiropractors, and physiotherapists, approach spinal disorders. This information will aid you to make a decision of the type of professional who might be able to help you, and with whom you may want to consult. Flexibility and strengthening exercise programs. These types of programs are important for keeping the lower back muscles flexible and strong. They are among the main safeguards for preventing future back injuries. It is important to begin slowly and progress as tolerated, using pain as your guide. The old adage “no pain, no gain” is definitely not the rule of thumb for the recovery of back pain. Heat. Heat is normally applied when there is a small area of tissue damage or inflammation. Electrical currents can be used to relieve pain and also to stimulate circulation in the deeper tissues. Electrical nerve stimulation. This includes transcutaneous electrical nerve stimulation (TENS), in which electrodes are placed on the back to gently stimulate nerves and helps alleviate pain. TENS appears to be helpful for some people with spinal stenosis, but has not otherwise been found to be generally helpful. An alternative version delivers the electrical stimulation through acupuncture needles. Treatment generally consists of 45 minute sessions, three times a day. Most people hardly feel the electrical sensation. Hydrotherapy. Hydrotherapy involves the use of water (hydro) to treat physical disorders and may include baths, spas, pools, or shower sprays. Tissue mobilization and massage techniques. Massage and a variety of soft tissue mobilization techniques are being used more often by therapists who specialize in manual therapy. These techniques may be helpful to increase circulation to the area, release muscle spasms, and stretch back tissues. Braces are often used in adolescents who have a spinal curve between 25-40 degrees, especially if they have at least 2+ years of growth left, in an attempt to halt curve progression. There is a chance it will afford a temporary correction, but it is more than likely that the curve will assume its original magnitude when the treatment ends. Traction Devices. Traction, or spinal stretching, equipment has been used to help decrease pressure on the nerve roots and provide a stretch to tight muscles in the back. Spinal traction has been well recognized since ancient times as an effective treatment for various spinal disorders. Traction can be performed in 2D (traction tables), or 3D for a rapid rehabilitation, where patients are mobile during treatment. See the Vertetrac on our product pages for more information, together with the DBS scoliosis rail. Back education. This involves teaching the correct posture and lifting techniques as part of a total back care program. This information helps people to adapt and adopt the right attitudes about the body and its functional use. All efforts to correct scoliosis non-invasively, using conservative treatments, should be investigated before resorting to surgery, if the curve is up to 40 degrees. Patients with curves of 40 degrees to 50 degrees or above are often considered for scoliosis surgery. The goal is to make sure the curve does not get worse, but surgery is highly unlikely to straighten the spine perfectly. During the procedure, metallic implants are utilized to correct some of the curvature and hold it in the correct position until a bone graft, placed at the time of surgery, consolidates and creates a rigid spinal fusion in the area of the curve. This means joining the vertebrae together permanently. In young children, a technique that does not involve spinal fusion may need to be used because fusion stops growth of the fused part of the spine. In these cases, a brace must always be worn post-surgery, until the child stops growing. What factors influence the recommendation for scoliosis surgery? What if I opt to do nothing about my scoliosis? Once the child reaches adulthood and has stopped growing, it is very rare for a curve to progress rapidly. It is well documented that once a patient is fully grown, scoliosis less than 30 degrees tends not to get worse, while those with curves greater than 50 degrees can get worse over time, by about 1 to 1.5 degrees per annum. The vertebrae are connected by small joints (facet joints) which may become strained and/or inflamed when they undergo forces when the spine is excessively twisting or arching, especially during activities such as tennis, racquetball, squash or golf. Mechanical neck and back pain is the general term that refers to any type of back pain caused by placing abnormal stress and strain on muscles of the spine. Usually it results from bad habits: poor posture often found in taller than average persons, poorly-designed seating, and incorrect bending or lifting motions. This is also the most common type of back problem seen in the sports-active individual. It accounts for 70-75% of all back problems and is usually the easiest to treat. Lumbar radiculopathy (often known as Sciatica) refers to symptoms of pain, tingling, numbness or weakness that travel down the lower back and into the leg or extremity. Any irritation or inflammation of a nerve resulting from disc herniation (also known as slipped disc) is called a radiculopathy. Scoliosis is quite simply a lateral curvature in the area of the spine that is normally straight. If viewed from the side, you would observe a slight roundness in the upper back and a degree of inward curvature in the lower back. The difference between a person with a normal spine versus a person suffering from scoliosis, is the former appears to have a straight spine whereas the latter appears to be curved, when viewed from the front or back. Approximately 2% to 3% of the population at age 16 have scoliosis which is a relatively high percentage, although less than 0.1% have spinal curves measuring greater than 40 degrees, which is the point at which surgery becomes a consideration. Most people have mild scoliosis and do not need any treatment. Girls are more likely to be affected than boys. Idiopathic scoliosis is most commonly a condition of adolescence affecting those ages 10 through 16. Idiopathic scoliosis typically progresses during the “growth spurt” years, but will not normally progress during adulthood. Degenerative scoliosis could happen to anyone since it is caused by illness, back surgery or other injury. If due to osteoporosis, this is normally found in the elderly.